When it comes to the cast iron and housewares industry, no one is more knowledgeable than Universal. For over 173 years Universal has been gracing the market with their amazing products, including cast iron food and meat choppers. While Universal is a company that is steeped in wonderful tradition, it loves to adapt to modern manufacturing techniques, so that all customers can receive the best products. One of these modern techniques is that of pre-seasoned cast iron cookware, which embodies the principles of reliability and dependability that Universal is known for. 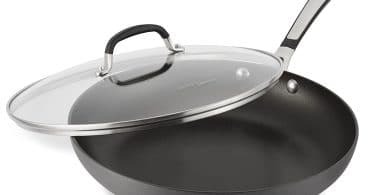 The Universal Housewares Cast iron 3-Skillet Set is just one of the amazing products that Universal has on offer, and this set has perfectly blended functionality and style so that you have a great cooking experience. If you love using cast iron to cook, then I would definitely recommend this skillet set to you. This set has all the design features necessary for preparing a quick and delicious meal at home, for your friends and family. We will be reviewing this versatile, sturdy, and durable skillet set below. 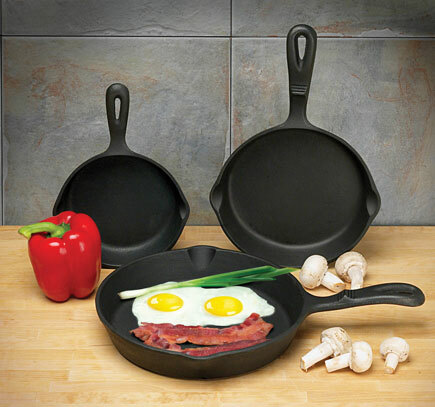 The Universal Housewares Cast Iron set is composed of 3 skillet pieces. These skillets measure 6.25 inches, 7.825 inches and 10 inches, allowing you to execute small and large meals with ease. The sturdy and durable sets are simple to use, and they allow you to cook with wooden, nylon, and silicone utensils. The most prominent feature of the Universal Housewares 3-Piece set is its cast iron construction. The cooking benefits of cast iron skillets are numerous, including better heat retention, superior heat distribution, elimination of hot spots, and flavor enhancement. Furthermore, these versatile skillets can be transferred from the stovetop to the oven with ease, and they can be used on multiple cooking surfaces, campfire’s and grills. So if you are looking for a long lasting skillet set that provides professional results and better tasting foods, then this easy to clean skillet set is perfect for you. One of the most impressive features of the 3-piece skillet set is the factory pre-seasoning. What this means is that the skillets are coated with vegetable oil at the factory site and then baked at high temperatures. The purpose of this is to give your skillet a natural food-release cooking surface, which is preferable to non-stick coating. The pre-seasoning also prevents your pieces from rusting. Universal Housewares skillet set is composed of a helper handle, which allows for a secure and comfortable grip when you are cooking. This skillet set is also stain, scratch, peel, and warp resistant, for optimum performance for years to come. Are the bottoms of the skillets flat, or do they have a raised ring along their outer edge? These three skillets are flat, and they have rings grooved in their bottoms. Can you re-season this pan? Yes you can. Above we talked about how the skillets get pre-seasoning treatment in the factory, but when they begin to appear dull or when they lose their non stick abilities you can re-season them from home. All you need to do is spread a layer of oil onto your skillet and bake it in the oven for around an hour. By doing this you extend its lifespan. If you love to sear your meat, fish and poultry in their natural juices, then this Universal Housewares Cast Iron 3-Piece Skillet Set is perfect for you. This cast iron set has all the features necessary to provide finger licking food, at a price that will not break the bank. Buy Pre-Seasoned Cast Iron 3 Piece Skillet Set on Amazon, Now!